Sunday dinner and a movie night can be challenging at times as the person designated to pick the evening's selection has a huge challenge. Trying to find a movie no one else has always watched (doesn't mind watching again), in a genre we can all enjoy and with good ratings on Rotten Tomatoes is not always easy. This last Sunday it was my turn. I began by surfing both iTunes and Netflix to see what was new, what was trending and looking through a few genres I knew we all liked. My original list of six or seven was quickly cut to four after looking at ratings. Then we crossed off those which one of us had seen and were left with one - Tracks, a 2013 Australian drama by John Curran. This movie is a film adaptation of Robyn Davidson's memoir which covered her 1977 nine-month, 2,700 kilometer journey by foot across the Australian dessert from Alice Springs to the Indian Ocean. She was accompanied by four camels who carried her gear and with her beloved dog who died during the trip. National Geographic sponsored this trip and their photographer Rick Smolan met up with her several times along the way to document it for their publication. Davidson wrote the accompanying article. Her memoir - Tracks: A Woman's Solo Trek Across 1700 Miles of Australian Outback - was released in 1980 and is still available for sale on Amazon. I'm happy to say we all enjoyed this film. The cinematography is stunning - in fact it has been nominated for several awards in this area. Davidson was played by Australian actor Mia Wasikowska and Smolan was played by American actor Adam Driver. The casting and character portrayals were on the mark. It was a bit of a shock at the start to see a disclaimer for aboriginals. Several of those seen in the movie are not longer alive and if I understand correctly, seeing the images and hearing the voices of those who have passed would be quite disturbing in their culture. I am glad that they had true first nation's people filling those roles, though. It brought a deeper authenticity to those scenes. This is a film portrayal of a real life journey, so it's hard to know where license has been taken to make it movie-worthy. The actress is fair skinned and the heat incredible, yet she is shown much of the movie with no hat on, with shoulders bare and sometimes naked. I would think heat stroke and severe sunburn would have been the outcome. Yet when I look at historic pictures of Davidson's trip like the one below, there are times her shoulders are bare and the hat comes and goes. The photographer has also noted in interviews that she often didn't wear a lot of clothing. He developed his own film instead of sending it in to the magazine raw as usual to protect her privacy. As someone fair-skinned I found it amazing that she didn't have to stay swathed in fabric from head to toe. It's important to remember this movie is not a Hollywood action movie. If you're looking for a fast paced script, look elsewhere. This script unveils a journey nine months long, condensed into highlights to give us a feel for what she experienced mentally and physically. Davidson's trip featured long stretches of just putting one foot in front of the other with only isolated experiences giving her small breaks. No car chases, nothing blowing up, no terrorists or people trying to steal her camels. I think the film managed to give that slow feel but in a way that kept our interest through these small highlights combined with vignettes showcasing the vast beauty of the area. One thing not shown in the movie was that Davidson carried tapes with her to help her learn the native language. Along this journey, practising ensued every time she had an encounter. Knowing this is based on a true story was startling for me personally. I just would not have felt safe as a woman alone in such a desolate territory. The bravery and determination of Davidson is monumental in my opinion, but I get the feeling for her these dangers never entered her consciousness. This journey was a pilgrimage that called her and that call had to be answered. Everything else was inconsequential. Last but not least is the casting. I enjoyed all the characters portrayed in this film and was pleased the casting director didn't fill the movie with just beautiful actors made up to look like something else. Older people living in isolated areas had wrinkles - aboriginals played themselves. The two main characters held to their roles and the supporting cast had many stand-outs. What was surprising was they also looked very similar to the people they were portraying in the film. 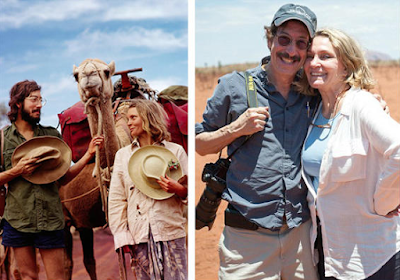 Above I have photos taken at the time of filming of both couples, but below I have included three historic images - one of the magazine cover, one of Robyn Davidson on her trip and one of Rick Smolan around that time. Definitely a film I enjoyed and would recommend if you like a movie with a slower pace. The cinematography alone is worth a look.